XP-8747-CE6 | Programmable Automation Controller with ISaGRAF and Windows Embedded CE 6.0 operating system. Communicates over USB, Ethernet, VGA, RS-232 and RS-485. 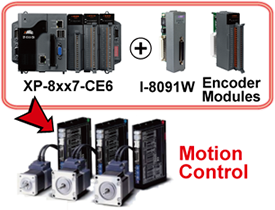 Supports Modbus TCP/IP and Modbus RTU protocol. Programmable Automation Controller with ISaGRAF and Windows Embedded CE 6.0 operating system. Communicates over USB, Ethernet, VGA, RS-232 and RS-485. 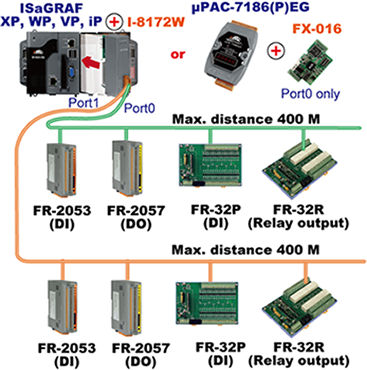 Supports Modbus TCP/IP and Modbus RTU protocol. The XP-8x47-CE6 (XP-8047-CE6, XP-8347-CE6, XP-8747-CE6, XP-8047-CE6-PRO, XP-8347-CE6-PRO and XP-8747-CE6-PRO) is the new generation of ICP DAS ISaGRAF Programmable Automation Controller (PAC). It is equipped with an AMD LX 800 CPU (500 MHz) running a Windows Embedded CE 6.0 operating system, and with IsaGraf inside. It supports various connectivity including VGA ports, 2 USB 2.0 ports, 2 10/100 Mbps Ethernet ports, 4 or 5 RS-232/RS-485 ports, and 3/7 slots for high performance parallel-type I/O modules I-8K series and serial-type I/O modules I-87K series, etc. Besides all the features the XP-8x47-CE6 has, the professional version XPAC XP-8x47-CE6-PRO also provides built-in Internet Explorer Software. The USB-mouse operations and Ethernet communication of the XP-8xx7-CE6 are more effective (consume less CPU loading) than the WP-8xx7 and VP-2xW7. The memory size (Flash and SDRAM) of the XP-8xx7-CE6 is much more than the WP-8xx7 and VP-2xW7. Each XP-8xx7-CE6, WP-8xx7 or VP-25W7/23W7 supports to link to max. 100 Modbus TCP/IP slave devices. Support various Standard Modbus TCP/IP Slave devices. 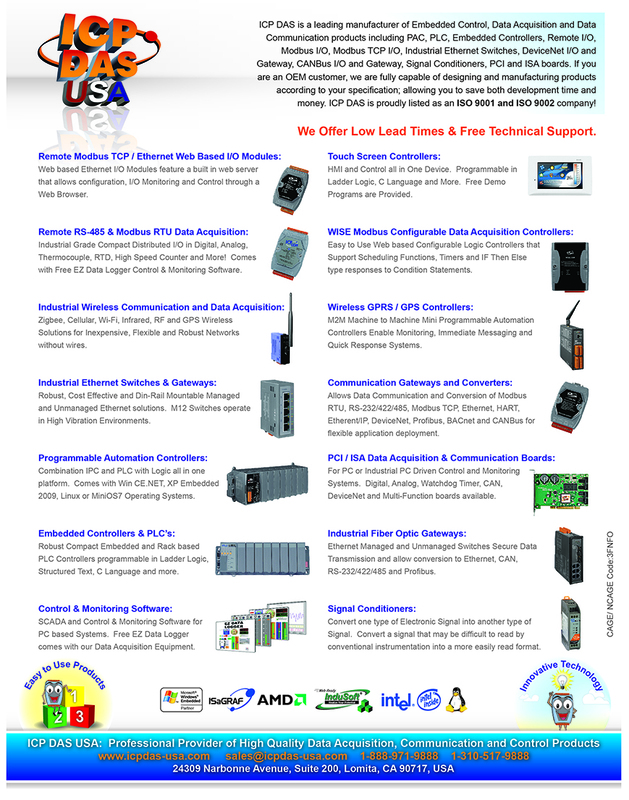 wiring cost, and achieve the mission of remote I/O control and data acquisition. 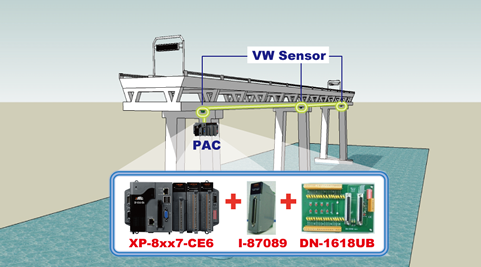 XP-8xx7-CE6 can support one I-87211W (slot 1~7) or I-87211W/GPS-721 as RS-485 remote GPS I/O. 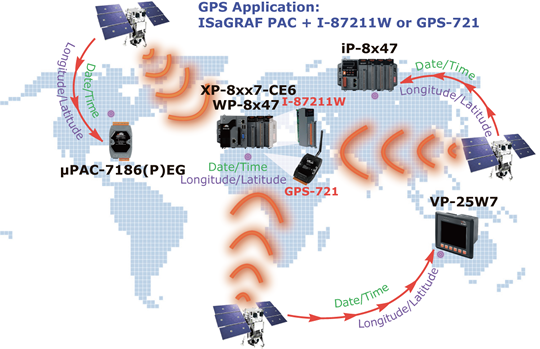 For doing auto-time-synchronization and getting local Longitude and Latitude. like building, bridge, dam, etc. This solution has been successfully applied in some water dams monitoring system near the city Wuhan in China. XP-8xx7-CE6 support max. 32 I-7530 (RS-232 to CAN) Converters. VC++ 6.0, VB 6.0 and ISaGRAF demo programs are available. Advantage: Every XPAC in the different location doesn't need a fixed Internet IP. Modbus RTU (RS-232/485/422) Slave : max. 9 Modbus RTU Slave ports. Modbus TCP/IP Slave : max. 64 PC/HMI/SCADA connections. 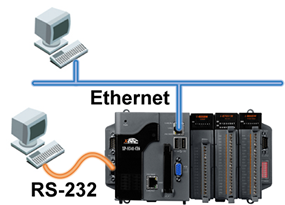 Modbus RTU/ASCII (RS-232/485/422): max. 33 ports. Only XP-8047-CE6 can use COM1 as Modbus Master port. 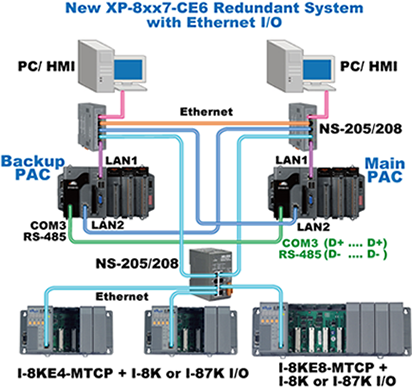 XP-8347-CE6/XP-8747-CE6's COM1 is for internal communication with I-87K modules in slots only. I-87K High Profile cards ). 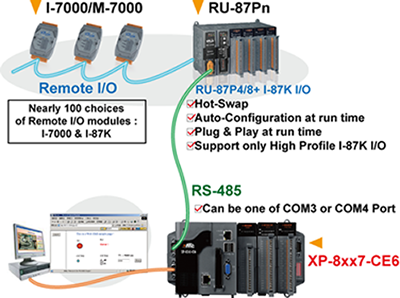 Auto-Configuration - Configurations of I-87K I/O modules can be pre-configured and stored in the nonvolatile memory of the RU-87Pn. Easy Duplicate System - Using the DCON Utility, you can easily make a backup of the I-87K module configurations and write to another RU-87Pn. Full Software Support - The free-of-charge software utility and development kits are included. Note: Doesn't support FRnet AI/AO modules yet. The scan of Ethernet I/O is much faster than that of RS-485 I-7000 or I-87K I/O. If one Ethernet cable is broken or damaged, the other one will still work. If one controller is dead, the other one will take over the control of the RS-485 I/O. 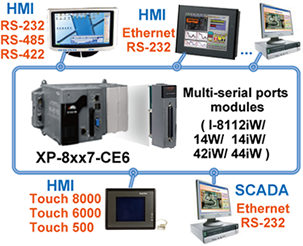 PC/HMI can connect to this redundant system by one or two active IP. The XP-8xx7-CE6-PRO can run its own Internet Explorer to monitor or control the local or remote I/O modules. 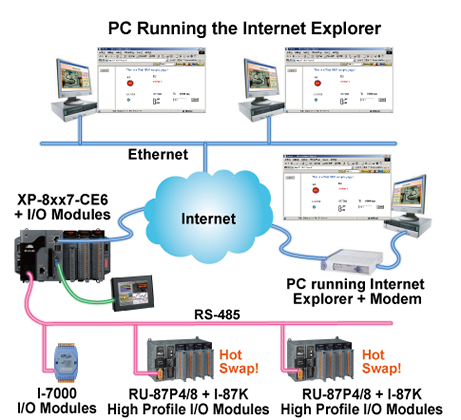 The XP-8xx7-CE6 require running Internet Explorer in PC to monitor or control the local or remote I/O modules. send information and alarms to user's cellular phone. The short message can be sent in multiple language format (like Chinese, English, ...... others). One I-8091W can control 2-axis: X-Y plane, or 2 independent axes. Two I-8091W can control 4-axis: X-Y plane + 2 independent axes or 4 independent axes. Data, date & time can be stored in Flash Disk or CF card, and then PC can load these data by FTP or Web HMI. Web HMI Support Web HMI function, PC running Internet Explorer can access to the XP-8xx7-CE6 via Local Ethernet, Internet or dial Modem to monitoring and control. Parallel DI Counter 8-ch. max. For 1 controller. Counter val: 32-bit. 250 Hz max. Min. ON & OFF width must > 2 ms. Optional DI boards: I-8040W, 8040PW, 8042W, 8046W, 8048W, 8050W, 8051W, 8052W, 8053W, 8053PW, 8054W, 8055W, 8058W, 8063W. Encoder I-8093W : 3-axis Encoder Module, max. 1M Hz for quadrant input mode, max. 4M Hz for pulse/direction and cw/ccw input mode. 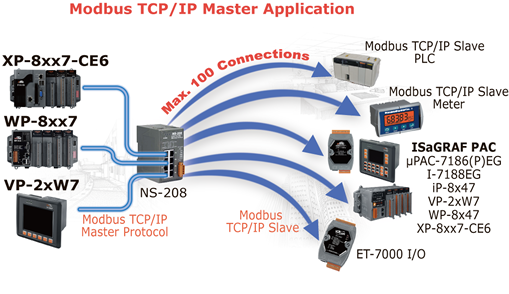 Modbus TCP/IP Slave Protocol 2 Ethernet Ports all support Modbus TCP/IP Slave protocol for connecting ISaGRAF & PC/HMI. 2 Ports support up to 64 connections. 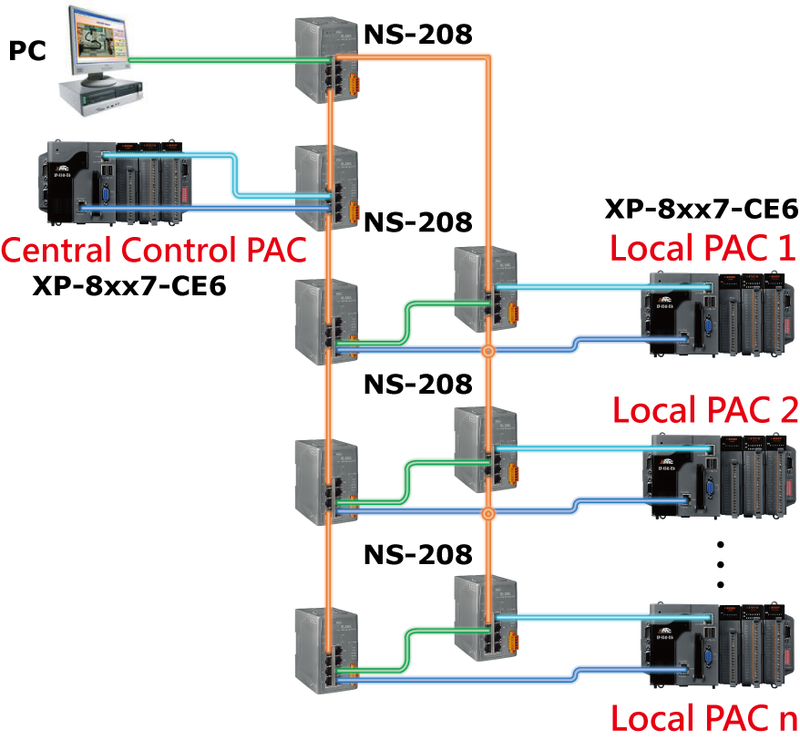 (If PAC uses 1 connection to connect each PC/HMI, it can connect up to 64 PC/HMI; If PAC uses 2 connections to connect each PC/HMI, it can connect up to 32 PC/HMI; ...) When one Ethernet port is broken, the other one can still connect to PC/HMI. RU-87P1/2/4/8 + I-87K High Profile I/O boards as Remote I/O. Max. 255 pcs. 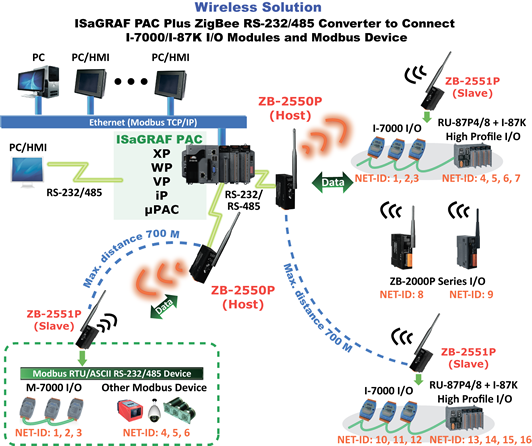 of I-7000/87K Remote I/O modules for one PAC. FRnet I/O Support max. 7 pcs. I-8172W boards in slot 1 ~ 7 to connect to FRnet I/O modules, like FR-2053, FR-2057 FR-32R, FR-32P. Each I-8172W board can connect up to 256 DI plus 256 DO channels. 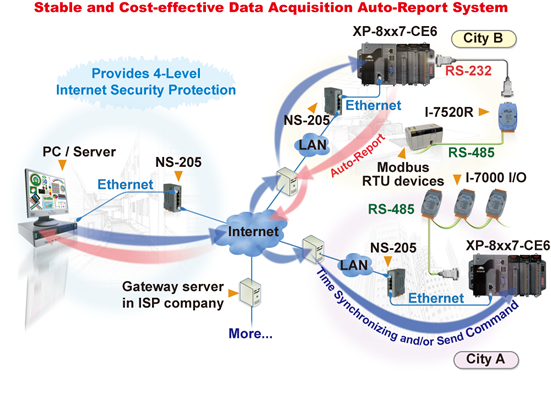 Ebus To exchange data between ICP DAS's ISaGRAF Ethernet controllers via Ethernet port. a 4 x 4 Keyboard to display picture, string, integer, float, & input a char, string, integer & float. Auto-Report) LAN1 or LAN2 support UDP Server and UDP/IP Client protocol to send/receive message to/from PC/HMI or other devices. For example, to automatically report data to InduSoft's RXTX driver. Auto-Report) LAN1 or LAN2 support TCP Client protocol to send/receive message to/from PC/HMI or other devices which support TCP Server protocol. For example, to automatically report data to InduSoft's RXTX driver, or to connect a local camera. Redundant System This redundant system has setup two "Active IP" address point to the active LAN1 and LAN2 ports always. 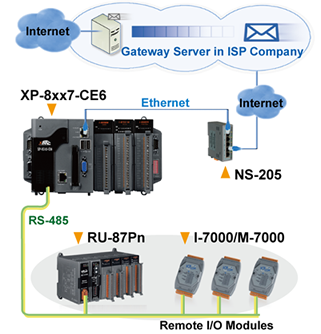 One or more PC/HMI/SCADA can communicate with this redundant system via one of the two given active IP. So the PC/HMI/SCADA can access to the system easily without any notice about which PAC is currently active. 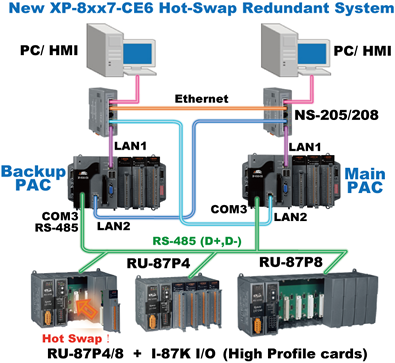 Moreover, the new redundant system can integrate with the RU-87P4/87P8 Expansion Unit plus the I-87K high-profile I/O cards to support the hot-swap application. If the I/O card is damaged, the maintenance person just takes one good-card with same model number to hot-swap the damaged one without stopping this redundant system. 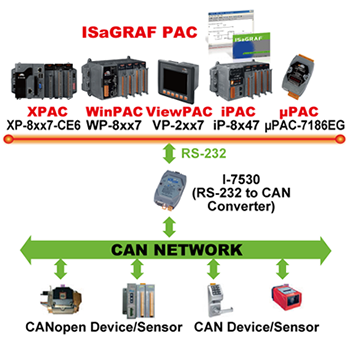 CAN/CANopen COM1, 2, 4, 5 or COM6 ~ COM33 resides at the I-8112iW/ 8114W/8114iW RS-232 expansion board to connect one I-7530 (converter: RS-232 to CAN) to support CAN/CANopen devices and sensors. 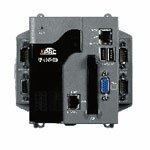 One PAC supports max.32 RS-232 ports to connect max.32 I-7530.